Maddi Bailey is the newest member and current fundraising intern for Care About Climate. She is a senior at Saint Louis University, where she studies environmental science and Spanish. Although Maddi is new to the Care About Climate mission, she became interested in environmental advocacy at a fairly young age. 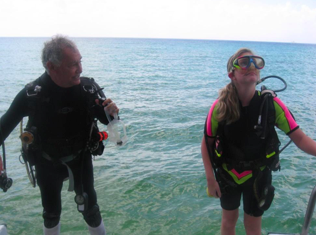 At fourteen she travelled to Cozumel, where she began learning about the hazards of non-environmentally conscious scuba diving, and the effects the sport can have on the oceans’ ecosystems. She developed a growing sense of urgency to protect the ocean’s rapidly declining coral reef population and to spread the word about the ways climate change can perpetuate their deterioration. Climate change affects our oceans in more ways than one, and making changes in human behavior to decrease our carbon footprint is the first step to reducing this impact. Since then, Maddi has been interested in increasing her own environmental consciousness and that of the community around her. She believes awareness is a pivotal factor in forming solutions around climate change, and hopes to be a part of educating people around the world through her work with Care About Climate. As the organization’s fundraising intern, Maddi aims to get people in the St. Louis community excited about Care About Climate’s mission and the efforts that go into making our mission successful. After she finishes her undergraduate degree at SLU, she plans to continue her work with Care About Climate as a climate ambassador, where she can be a catalyst for the movement on an international level.